As I said the first week it rained...a lot. That wasn't all bad. I did get a chance to read a bit. I brought along On Aggression by Konrad Lorenz. I'm not much of a biologist so a lot of the animal behavior descriptions flew over my head. But, I felt right at home with the above diagram. How nice to find a Caley table in the middle of a ten page meditation on the nuances of the duck and drake mating ceremony! Remember your multiplication tables? This is a binary operation. A binary of operation of what? 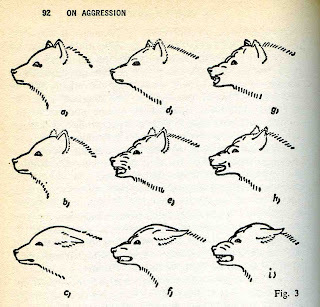 Lorenz call the above diagram a motivational analysis Each picture on the diagram is a combination of the dog's fight or flight instincts. If you go down the left most column, you are seeing the progression of the flight instinct. Going across the top most row, you are getting the progression of the fight instinct. Any other image is some combination of the two instincts. All part of the math of mother nature. Quite interesting!